WELDED STEEL FRAME1.5" x 3" steel tubes form the core of this frame's strength and durability. Backed by a limited lifetime warranty. HEAVY-DUTY WELDED STEEL DECKProvides superior strength and durability. SIMPLE MAINTENANCEEasy-to-access service areas for simpler maintenance. LARGE DRIVE TIRES22" drive tires provide better control and stability. EXCLUSIVE SMOOTHTRAK™ STEERINGThe most precise steering in the zero-turn industry is only found on a Hustler®. PREMIUM SEATCustom, bolstered vinyl seat with internal suspension for superior comfort. Hustler’s all new Raptor is designed to the highest of standards and is poised to lead the zero-turn market in the entry level category, delivering the best-in-class overall value versus the competition. The Raptor is powered by a KOHLER engine and is built with a fabricated steel deck, setting it apart from all other products in its market. 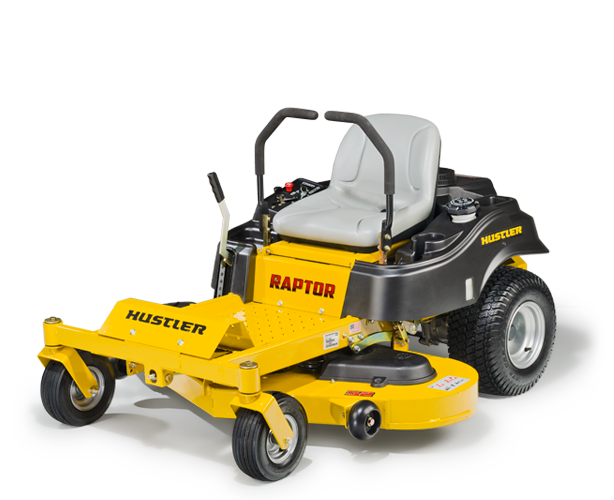 The Raptor also features Hustler’s patented SmoothTrak Steering and its Automated Park Brake System. The Raptor is built with the same great quality Hustler has been committed to for almost fifty years and is backed by Hustler’s industry leading three-year warranty* and unmatched customer care. Heavy Duty Fabricated / welded steel decks, not stamped.